Ronnie O'Sullivan admits he may not have the motivation to equal Stephen Hendry's record of seven World Championship titles. The 38-year-old starts the defence of his World Championship crown against Robin Hull in Sheffield on Saturday. His five titles are one fewer than Steve Davis and Ray Reardon. Hendry's seven is the highest in recent times. "That record is something that if it happens, it happens, but I'm not sure I have the motivation," said O'Sullivan. The Essex cueman is hoping to win his third title in a row and emulate the achievements of Hendry, who won five in a row from 1992 to 1996, Davis, who was victorious from 1987 to 1989, and Reardon, who dominated from 1973 to 1976. 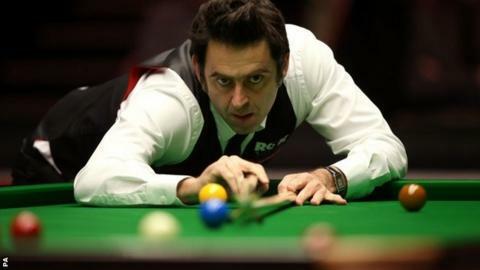 O'Sullivan, also champion in 2001, 2004 and 2008, is favourite to triumph again this year, but admitted matching Hendry's record is not something that motivates him at this stage in his career. "Sometimes I ask myself if I was lying in hospital with a couple of days to live, would I say 'I wish I had won seven or eight world titles?'" he told BBC Sport. "When I think of it like that, I probably think it is not the most important thing in life. "I try not to get sucked into trying to equal Stephen Hendry's record or even break it. For me it is about enjoying my life and what is important is having a good time while I'm here. "I don't want to play snooker forever. I've got to the point where I do not enjoy practising but I do it because I want to do myself justice when I'm out there." He added: "I think I have already got my bit of history in the game. I could win some more, that would be great, but I am just happy being here having won five world titles." O'Sullivan admitted that breaking Hendry's record would be "asking a lot". He told Eurosport: "I can't put myself in that league just yet. I'm not saying it can't happen because you never know. "But I don't want to put unrealistic targets on myself, or unnecessary pressure. I can't expect to win another three going into my 40s when nobody has won more than one beyond the age of 31 over the past 40 years, apart from me and John Higgins." Former world champions Ken Doherty and Shaun Murphy both also start out on Saturday. Doherty, the winner in 1997, faces world number six Stuart Bingham, while 2005 champions Murphy takes on qualifier Jamie Cope. Ding Junhui, who is aiming for a record-breaking sixth ranking title win of this season, opens his campaign against Crucible debutant Michael Wasley on Sunday. And world number one Neil Robertson, bidding to regain the title he won in 2010, also faces a Crucible newcomer in Wallasey's Robbie Williams, starting on Monday. Welome to the website of snooker professional Mark Selby. Read more on Welome to the website of snooker professional Mark Selby.